A cultivar of Camellia japonica L. Fully double flower resembling a full-blown rose, the centre petals being shorter and rounded, sometimes twisted, with dark veins and a white stripe down the centre. [Don, ICR]. ‘Bud obtuse, large, with greenish scales; flower three inches broad, full, flesh-colour approaching a pale yellow as in No.3.-Superb.’ [Berlèse Monography p.83/1838]. 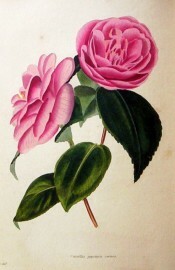 ‘The variety of the Camellia here represented was introduced about the year 1807. It is a remarkably free grower, usually making longer shoots than any of the other kinds.’ [LBC no.455/1820]. Camellia japonica flore pleno rosea, the ‘Rose-coloured Camellia’ was figured in Andrews' Botanical Repository, the flowers described as rose-coloured, the outer petals large and spreading, the inner small and upright, the leaves broad and shining. This could be carnea. It was reportedly introduced to the Royal Gardens at Kew about 1808. [ABR pl. 660/c.1814]. According to Chandler, Middlemist introduced ‘Carnea’ to Kew in 1804. [ICR]. Received per ‘Sovereign’ February 1831. [MP A2948-2]. This camellia is ticked in William Macarthur’s copy of Don, together with all of the camellias listed in the 1843 catalogue. It is a reasonable assumption that it was still grown in the garden at this time although it never appeared in the catalogues. Carnea is listed in both the 1830 and 1836 editions of Loddiges’ Nursery catalogue, copies of which are held at Camden Park [CPA]. In the 1830 edition it is marked with a ‘+’, the meaning of which is unclear. In 1836 it is marked with a ‘c’. It was also marked ‘x c’ in an article in the Horticultural Register. Although this book originally belonged to James Bowman, it seems to confirm that Carnea was grown by the Macarthur family at this time [HR p.634/1832]. Elsewhere ‘c’ means grown at Camden and ‘x’ signifies common before or long introduced.